Fiat and Chrysler have completed the strategic alliance that will put Chrysler's good assets into a new firm. Fiat chief executive Sergio Marchionne will take control of the new company, which will begin operating immediately. Fiat is not paying any money for its 20% of the new firm but will contribute technology to make smaller Chryslers. The deal was completed on Wednesday after the US Supreme Court dismissed an appeal against it from three Indiana state pension and construction funds. "This is a very significant day, not only for Chrysler and its dedicated employees, who have persevered through a great deal of uncertainty during the past year, but for the global automotive industry as a whole," said Mr Marchionne. The deal paves the way for Chrysler to emerge from bankruptcy protection. Fiat's shareholding will expand to 35% if certain targets are met. The United Auto Workers union gets 55% of the new company, while the US and Canadian governments will take stakes of 8% and 2% respectively. The pension funds, which hold about $42m (£26.3m) of Chrysler's $6.9bn in secured loans, were opposed to the sale, saying it inverted usual bankruptcy practice by paying unsecured creditors, such as the union, ahead of secured lenders. Chrysler filed for bankruptcy protection on 30 April, suffering from depleted sales, huge debts and crippling labour, pension and healthcare costs. The new Chrysler will still have its headquarters in the US state of Michigan and will produce Chrysler, Jeep and Dodge branded vehicles and Mopar spare parts. As part of the creation of the new Chysler, 789 franchised dealers have either closed down or stopped selling new Chrysler vehicles. The factories that have been temporarily closed during the bankruptcy process should be resuming production shortly. 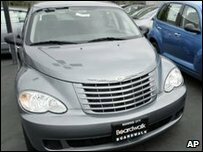 "Those Chrysler operations assumed by the new company that were idled during this process will soon be back up and running, and work is already underway on developing new environmentally friendly, fuel-efficient, high-quality vehicles that we intend to become Chrysler's hallmark going forward," Mr Marchionne said. The Obama administration backed the tie-up with Fiat, arguing that Chrysler had been unable to operate independently since it was spun off by the German carmaker Daimler.